Kids Inflatable Pools & Slides. 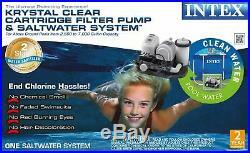 Intex 120V Krystal Clear Saltwater System Pool Chlorinator & Filter Pump 28673EG. 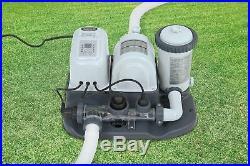 Brand New Intex 1200 GPH Filter Pump with Krystal Saltwater System Model 28673EG! Designed specifically for Intex Above Ground Swimming Pools up to 7,000 Gallons, Intex 1200 GPH Filter Pump Saltwater System 28673EG is simple and easy to setup. The ultimate eco-friendly pool water sanitizer... Chemical-Free, sanitized and sparkling clean pool water! The Intex 1200 GPH Krystal Clear Filter Pump & Saltwater System eliminates the need for dangerous, harsh chlorine while dramatically improving your pool's cleanliness and your comfort level. The Copper Ionization feature reduces chlorine levels by 70% when compared to standard saltwater systems. Automatic self-cleaning cycle lengthens cell life and reduces the need for manual cleaning. The 1200 GPH Filter Pump with a 1050 GPH System flow rate utilizes an Intex 29000E Type A/C Filter Cartridge to Filter your pool water. The system is able to filter up to a 7,000 gallon pool, the filter pump collects debris floating in the water. The Intex Krystal Clear Filter Pump & Saltwater System is the ideal way to keep your pool safe and clean all summer. This System is designed for use with Intex brand swimming pools up to 7000 Gallons. Intex brand pools say "Intex" in large white letters on the pool wall. If your pool does not say "Intex" on the pool wall, it is NOT an Intex brand pool. We do not guarantee fitment with any other brand of pool or any non pool application. 1200 GPH Filter Pump System with a system flow rate of 1050 GPH. Type A/C Filter Cartridge - 29000E. Krystal Clear Saltwater System&###x2122; Eliminates bacteria and algae from pool water using virtually undetectable amounts of economical, eco-friendly salt. This system produces low levels of natural chlorine that swimmers neither feel nor smell. The result is soft, fresh, clean water without the potential harsh side effects of packaged pool chemicals! Saltwater System for Above Ground Pools. Much gentler on skin, eyes, clothes, and hair than packaged chlorine. Say goodbye to continuously adding chemicals to your pool water &###x2013; no more ongoing expense and trips to the store. No chemical smell, no faded swimsuits, no red burning eyes, and no hair discoloration! Creates salt levels about one-tenth that of the ocean, so swimmers won&###x2019;t see, feel, or smell any salt. When water evaporates, simply add more water &###x2013; the salt level will remain the same. Salt does not evaporate &###x2013; Unless water is splashed out of the pool, you may never have to add more salt! 24-hour Auto Timer for extra easy pool maintenance. 1&###xA0; Intex 1200 GPH Filter Pump Krystal Clear Saltwater System - Model 28673EG - 110-120 Volt. 1 Type A/C Filter Cartridge. 2 Intex 1 1/2 Screw on Hoses. We deliver to 85% of the Continental US in 3 Days or less! We truly appreciate your business! Windy City SuperStore is here assist you. Please see individual item return policies for specific details. We will do our best to accommodate your request but we cannot guarantee the order will be cancelled. Tracking numbers are not "active" until the order is scanned into the carrier hub in the evening. This listing is currently undergoing maintenance, we apologise for any inconvenience caused. The item "Intex 120V Krystal Clear Saltwater System Pool Chlorinator & Filter Pump 28673EG" is in sale since Sunday, January 31, 2016.